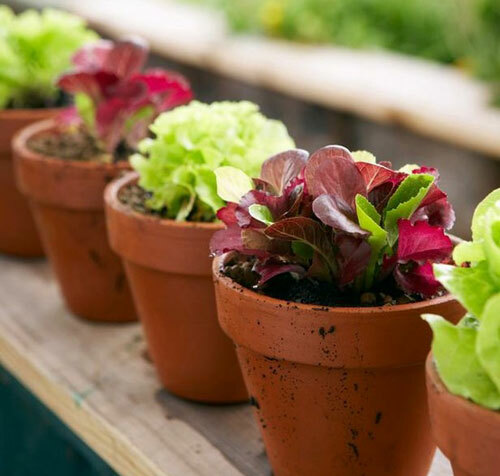 If you want to try to grow some of your own food and don't have the space to plant a garden, then growing lettuce in a garden container is a great idea. 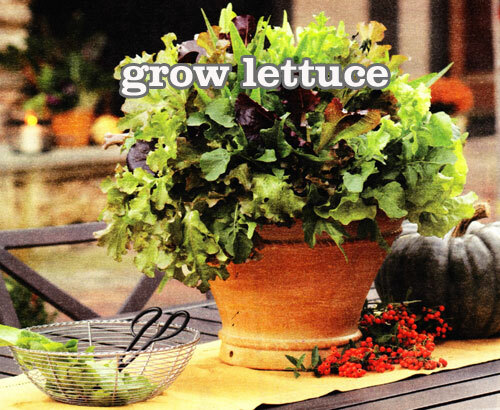 Lettuce is one of the easiest things to grow in a flowerpot and it likes the cooler weather. To get started select the containers you will use. Terracotta clay is great because it breathes and it healthy for any root system. Make sure it's got some depth to it. 6" of depth and a drain hole is a great place to start. We also like a generous sized flowerpot so that you can get a variety planted. Head to your local garden center and buy the types of lettuce that interest you the most. Get a six pack of starter plants, and a small bag of potting soil. When ready to plant make sure the pots are clean. If not use soapy water and let dry. Cover the drain hole with pot shards so that the soil doesn't wash out. Fill with soil and then push the plants into the spaces you want. Make sure they are about 4" inches apart. Tamp soil down about the starters and give them a good drink of water. 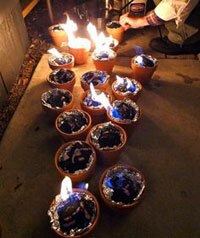 When placing the pots, make sure they are in a location where they will get at least 6 hours of sunshine a day. Keep the soil moist and fertilize occasionally. Your lettuce should grow during fall and some winter. Read more.....Around your garden in winter. Read more.....Winter care of houseplants. Don�t have a fire pit? Not located by the beach? Don�t camp? 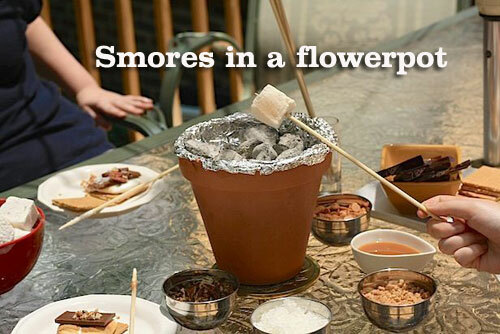 Well that doesn�t mean you can have some smores right in your own backyard. It�s so easy and fun to do! 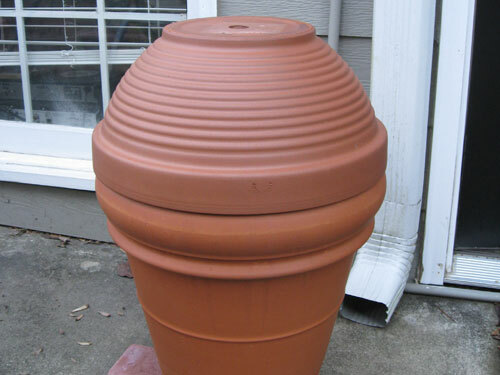 First get a clay terracotta flowerpot that is big enough to hold your charcoal. We recommend using a 12� pot. It�s smaller than shown but big enough for a group of people. 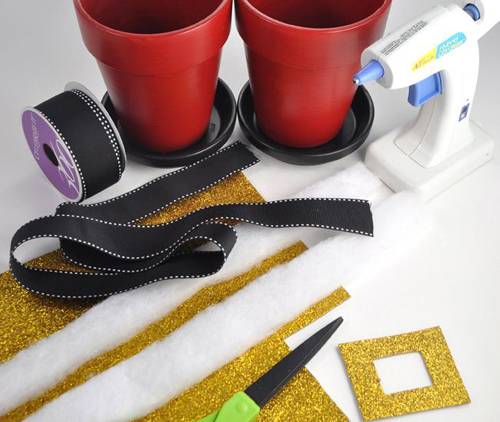 Line the flowerpot with foil wrap. Fill with BBQ charcoal. You may need lighter fluid. Light the charcoal and get the coals going. Hand out sticks, and smores fixings and get started. When all is done, let the ash cool, wrap the foil up, and toss away. No mess and lots of fun memories! We also like the idea of making individual burners. Each person will get their own flowerpot and fixings and you make a party out of it. You can also decorate the flowerpots for the occasion. Paint the containers for sport team colors, holiday colors, or just decorate them for fun and a creative touch. This is the time to have fun and most of all enjoy! Read more.....Small space for container gardening. Read more.....Container ideas to share. Love this crafty idea using our clay flowerpots. This project is a bit more involved but look how cute they turn out and you will have them for year of year to display. These would work great for place holders also by writing the names of each guest right on the pot rims. Directions: Paint the clay flowerpots blue with a white rim. When dry use a toothpick and white paint to decorate the pot with snowflakes. When dry, apply a sealer. Use a liner brush to paint an orange nose onto the back of the spoon. Use a toothpick dipped in black ink to paint the eyes. Use a black pen to add simile and eyebrows. Cut a 1/2" wide strip of felt and fringe the ends. Add a dab of hot glue about 3" from the right end. 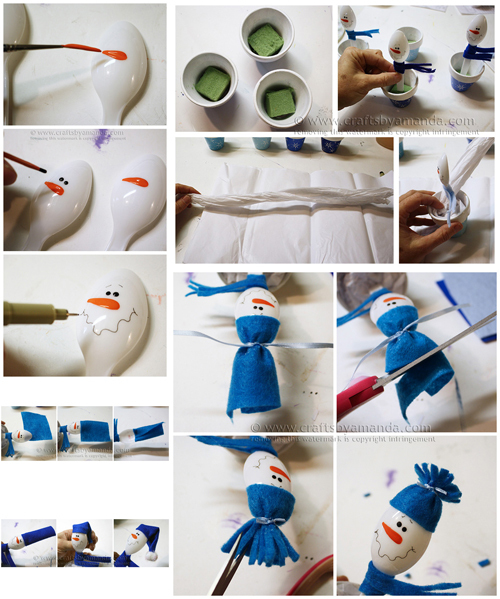 Place the snowman into the glue, then wrap the scarf around several times, securing with more hot glue. Cut a small square of floral foam so that it fits snugly inside the clay flowerpot. Insert a snowman spoon into the foam. Tear or cut a sheet of tissue paper in half, roll up and fill the inside covering up the floral foam. There are 4 different hat options so if you want more detail click this link. To finish the flowerpots off, top them with sparkly pom poms to look like snowballs. Growing potted houseplants is a hobby that can be enjoyed by everyone. You don�t need to get green thumb gardening to keep them healthy. 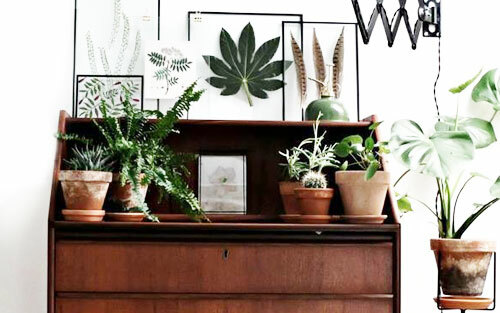 If you notice most designer photographs show a room that always has a houseplant in a decorative container. That is because they offer color, warmth and a touch of love and, make any area come alive. When purchasing a new plant at your local home and garden center or nursery, make sure it is healthy. This is not the time to nurture a sick plant back to health. Look for lush green leaves, moist soil and plump stems. Nothing dry, slimy or black is healthy. Houseplants don�t need a lot of attention but they do need, light, water & fertilizer. Sunlight is the standard which all light is compared. 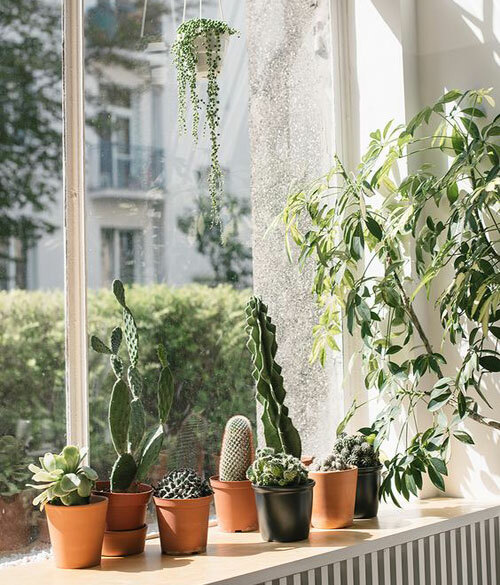 Make sure you potted houseplants are near a sunny area, and make sure that they aren�t in a drafty window or near a hot wood stove. Temperature is important. Try to use a potting mix that helps the soil hold water and nutrients. Water according to the directions. Improper watering is the most frequent reason indoor plants die. Remember, it�s always better to underwater than over water. Establish a schedule to help make this task easier. Lastly, don�t underestimate the importance of fertilizer. Soil loses its nutrients over time so if you want to keep your indoor potted plants healthy for the long term then fertilize on a regular basis. When it comes to selecting a garden container to pot in we have a few basic recommendations. 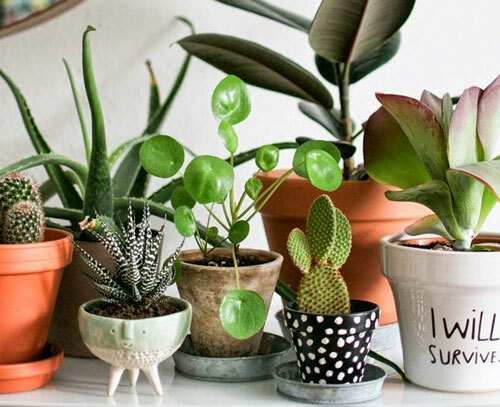 Always use a pot with a drain hole, clay is porous and breathes, and always go with a bit larger than needed so the roots have room to expand. By understanding these basics houseplant needs, your plants will grow healthy and lovely for a very long time. Read more.....Happy herbs & Herbs that heal. True BBQ means cooking meat over low heat for a long time, often many hours. 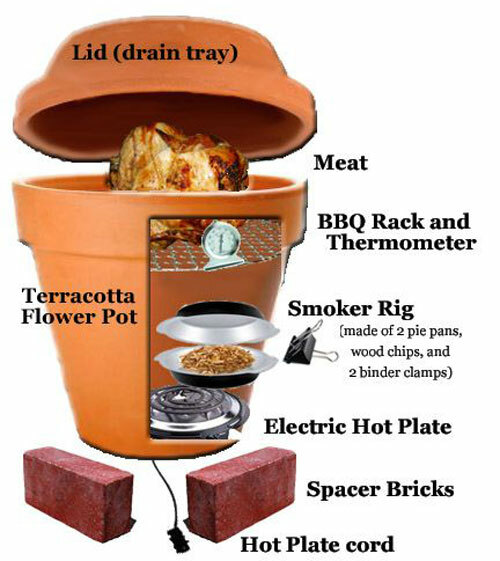 Smokers are so expensive some starting at $300.00 So when Alton Brown on the food network showed how to make your own and used our clay terracotta garden pots we were thrilled. Here are the links to where the pots are located on our website. Stop crying over broken pottery or porcelain. Instead, recycle the shards of a plate or vase to create these unique garden planters. Before you begin, seek out your raw materials at flea markets or garage sales. You'll find chipped and cracked pieces are dirt cheap, but perfect for your purposes. To keep things looking good, stick a common blue-and-white look. Or, if you are a bit braver, create your own color scheme. The instructions below explain how to create these eye-catching pieces. TRY TO LEAVE FAIRLY EVEN GAPS BETWEEN THE MOSAIC PIECES. Wear protective eye wear while creating your mosaic pieces. Break plates or fragments by covering with a thick cloth and hitting with a hammer. Use a tile nipper to trim pieces to size. Apply china repair adhesive to the back of each piece; press against the flowerpot. Allow glue to dry overnight. APPLYING THE GROUT. Apply premixed grout from a hardware store or home center to the entire surface of the clean, dry pot. Make sure you completely fill between the shards of pottery for a unified look. If you prefer, leave the rim exposed for decorative contrast. SMOOTHING THE GROUT. Use a tile float to smooth and even out the grout. Allow the pot to dry for several hours. A hazy film of dried grout will appear on the tile. Carefully wipe away this film with a damp sponge. Rinse out sponge as needed. WIPE GROUT FILM OFF TILE SURFACES WITH A DAMP SPONGE. Allow the new beautiful flowerpot to dry for a week. When you are sure the grout is completely dry, seal with a grout sealer. In addition to their service as homes for blooming plants, these pots are ideal for parties, or as potting shed accessories to hold pens or hand tools. Read more.....Add some outdoor organizers. 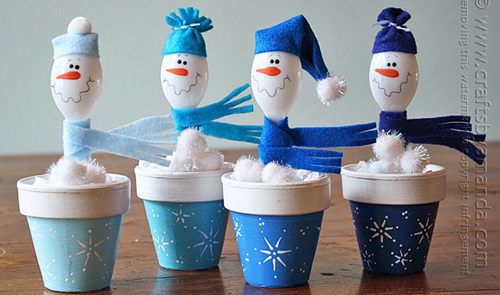 This Christmas craft project is really easy and oh so cute! 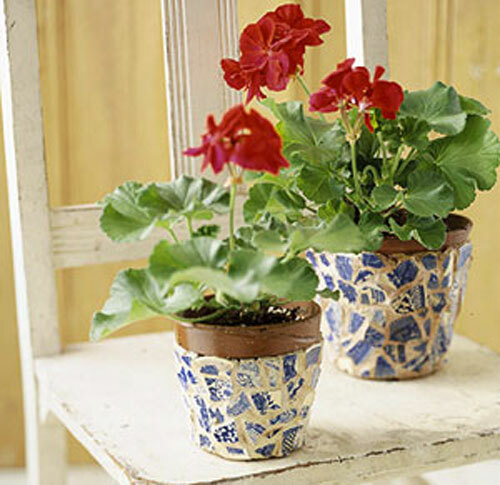 Use these little clay flowerpot crafts to decorate around your home with. They are just adorable and can be stored from year to year. A child friendly craft! 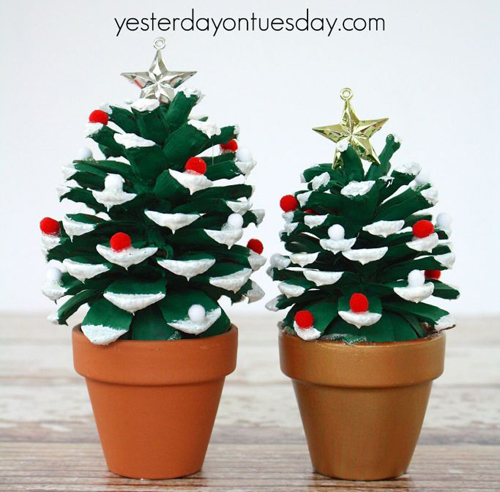 Materials: Pine cones, small terracotta flower pots, green acrylic paint, white acrylic paint, stickles (glitter glue), white or red pom poms mini starts & craft glue. Directions: Paint pine cones green, let dry. Paint tips of pine cones white, let dry. Add stickles to white area to make it look like snow. Add mini pom poms to trees. Top with a little star. Glue pine cone to terracotta flower pot. Read more ..... Make a chair planter. 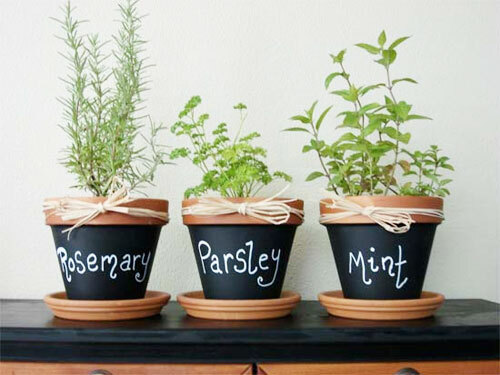 You love the thought of potting herbs to put into your kitchen so that you will have them to cook with. 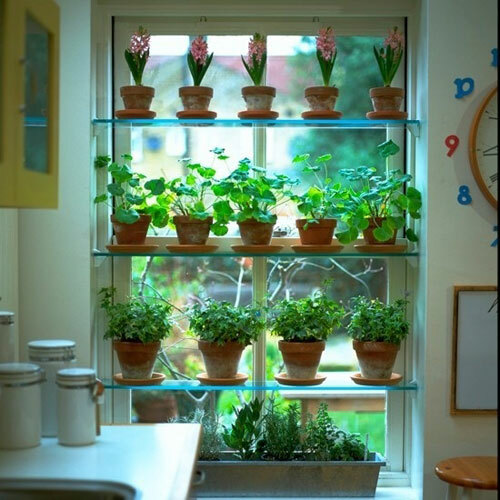 But, here�s another reason to have herbs in flowerpots indoors & nearby. They naturally purify the air! Here is a collection of potted herbs that help with indoor pollution, bad odors and help to lower the carbon dioxide around your home naturally. Some will help to repel flies in the kitchen like basil and none will grow too tall if you use smallish sized clay pots. Rosemary: You all know how great it is to cook with. The needle like leaves when chopped are perfect for cooking or a tea. But did you know that besides it�s pleasant aroma a potted bunch of rosemary, purifies humid winter air! Rosemary breathes carbon dioxide and exhale oxygen. Some of the essential oils will exhale into the air so you don�t even need to cook with it. Basil: A pot full of basil gives off a rich aroma. It will also reduce the carbon dioxide in a room besides repelling flies in the kitchen. It has a wonderful peppery taste that is used in Italian dishes. Pinch off leaves when cooking to add a wonderful fresh taste to a savory dish. The aroma it gives off is heavenly. Mint: Ok we all know this makes a wonderful hot tea for winter. A flowerpot full of fresh mint makes the air easier to breathe if you have a cold. It has a wonderful soothing aroma. You will rest easier at night with a small pot of mint next to your bed. Jasmine: Perfect for tea but also when potted and placed around the house will fill the home with fragrance along with purifying the air. A perfect combination! It is an inexpensive for of air freshener and all natural. So, think about these wonderful herbs when you are looking for air purifiers for around your home. Indoor this time of year in colorful or traditional little pots is easy, perfect & complimentary! 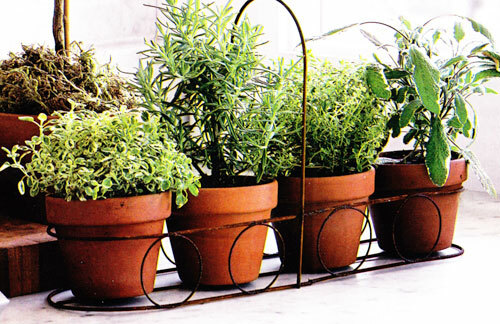 Read more..... Let's create a indoor herb garden. Read more..... Tips for growing cilantro in a garden pot. Autumn in here and it�s that time of year when you can savor and appreciate your fall potted foliage. Fall perennials are the perfect choice. 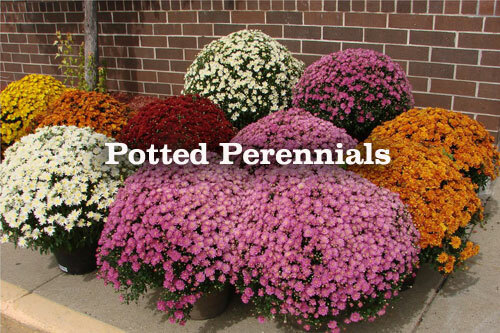 Fall perennials in garden flowerpots provide a range of colors from pink and purple to white and gold. They offer a bloom that you can depend on and will bless you with color year round. Dried flower head and stalks left to stand over winter will provide shelter and nourishment for birds & other wildlife. Below are a few of the popular potted perennials that you may enjoy. Sedum: Varieties like Autumn Joy have pink to red flowers that turn maroon as colder weather hits. It favors full sun and average garden soil. A wonderful late season perennial. Asters: Classic fall bloomer, they are often planted to compliment other fall blooming flowers like chrysanthemums, which you see everywhere this time of year. They range in color, height and size making them perfect for any display. Mums: They are fall�s ubiquitous flowers. Every garden center offers them this time of year for a reason. Their colors are perfect for a fall display. Yellows, orange, and rusts are perfect when potted on a holiday table or the front entry of your home. It shouts we are into the season!!!. Place the planters indoors for color or outside for fall beauty. Goldenrod: There flowers are perfect for insects and bees. With its bright yellow flowers and long stalks they are perfect in any garden planter where you want color and beauty this time of year. So, don�t leave your flowerpots sitting empty as the weather cools. Plant some of these suggestions and enjoy the beauty the flower kingdom has to offer. Read more..... Start now to plant spring bulbs. 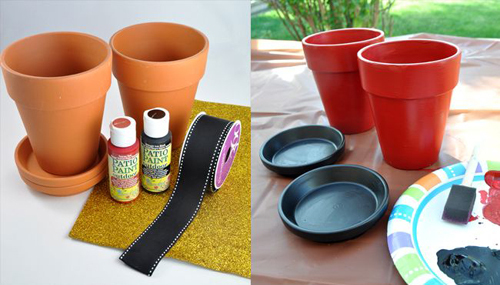 We love our clay pot craft ideas and are constantly searching the web for new ideas. There are so many creative people out there and lots of easy, fun ideas. 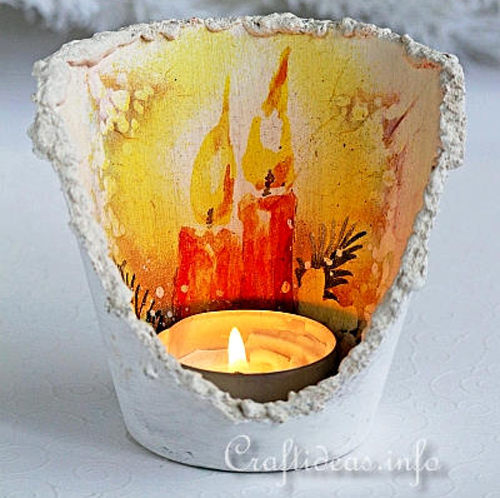 Here is how to make a broken clay pot into a decorative candle that can be used during the holidays or when changing out the applique, would work great with lots of other holidays. Give it a go and let us know below how it worked for you! When the winter evenings are chilly, this decoration warms the heart. Choose a motif with a rustic country look. With a small tealight candle in the center, the design lights up with a winter glow. 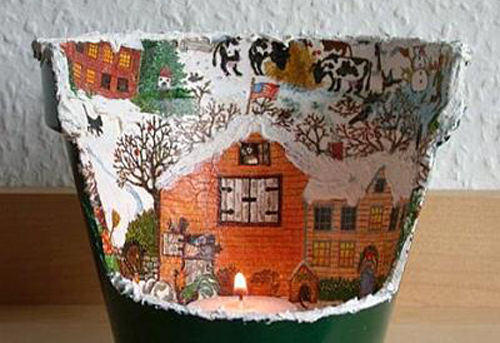 The motif is a paper napkin, decoupage onto the inside of a flower pot. Perhaps you know someone who can cut you a couple of unused pots this way or you can find a broken pot. Either way ArizonaPottery.com has the pots for all your craft needs. Share with us below on how you did! Hope you liked this craft project. Stay tuned we have plenty more! Read more..... Pot an Amaryllis Now. 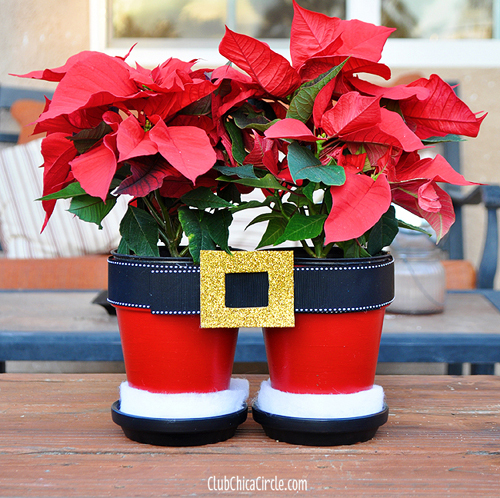 Read more..... Year round containers. 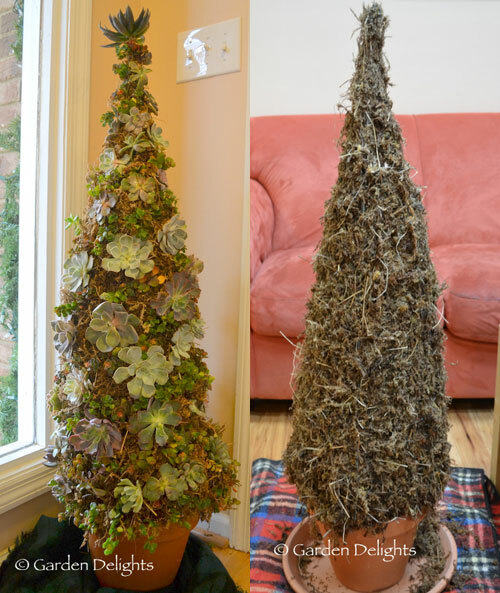 Making a container Christmas tree out of potted succulents is smart & lovely! Check this out from Garden Delights. Turn the tomato cage upside down. Gather the legs to a point and bend the wires together to secure. Wrap floral wire around the gathered legs to keep them together. Make a netting of floral wire by wrapping it vertically around the tomato cage. After the vertical wires are in place, weave through them horizontally. This netting will provide support for the moss. You should now have a tree form. Fill a bucket with warm water. Add the moss and soak till saturated. Squeeze out excess liquid. Add handfuls of moss into the form starting at the top. Use the wooden spoon to help push into crevices. Hide all the wires. Place the moss tree upright in your chosen container. The moss may drip so make sure you planter is large enough and you have a saucer underneath to catch drips. Make sure everything is balanced before you start adding succulents. Use a pencil to pock a hole in the moss and insert the stem in, securing it with a floral pin. Finish covering the form. This potted tree may be heavy so have someone help you move it to where you want it displayed. OR better yet, place it in advance and cover the area with a blank till you are finished making it. Spritz when completed. You now have a live Christmas tree! Read more.....Vertical gardening and more. Read more.....Let's pot an evergreen tree. 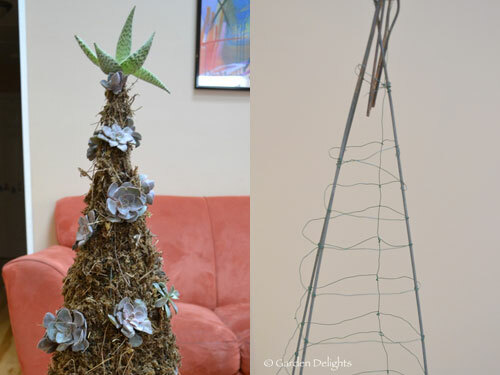 Create A Living Christmas Tree! The days of silver foil Christmas trees are over and people are once again returning to real trees. The most real tree of all is a living tree, roots and all, that you can plant outdoors after the holiday. In all but the warmest parts of the country, you will be looking at hardy evergreens � such as spruce, fir and pines � which are sold potted in containers, or balled and bur lapped. Live trees are not inexpensive so before you head out consider the following�..
1. Size: Think small. Really small. If you are use to a 7� tree commanding a quarter of your living room, think again. First of all subtract at least 18� from the height of the tree for the root ball � in other words, you would be decorating a 5� tall tree. Then consider that you would need half a football team to carry the tree inside the house. A tree that size may weigh 100 pounds or more. Also, think about the pot that you are hoping to plant in. We suggest moving the planter into the home first and then setting the live tree inside once you have it positioned where you want it. Be prepared to move the potted tree outside once the holidays are over. 2. 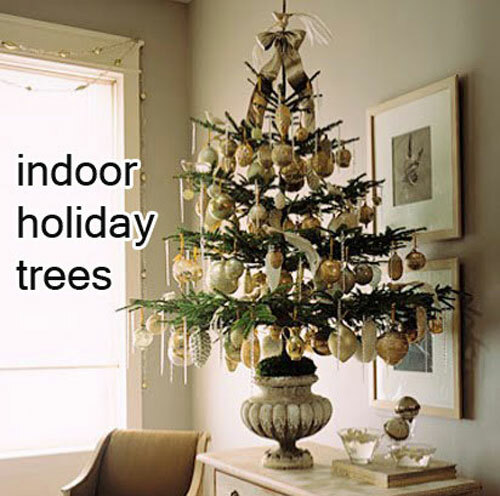 Time spent indoors: Evergreen trees don�t go completely dormant in winter, but they come close to it. If you bring the tree indoors for a month, it will start to break dormancy. Then when you plant it outside in January it may suffer freeze damage. Plan to keep it indoors for a week and no more than 10 days, preferably in the coolest room out of direct sunlight. 3. Future size: Most spruces, firs and pines get big, really big as in 50 to 100 feet tall. Can you yard accommodate such a large tree? You can keep the trees in the original container for a few years, but they will soon outgrow even the largest planters. 4. Containers: This is not the time to plant directly into the pot unless you plan on moving the whole potted tree onto the patio or porch. The best laid plan is to select a garden planter that you can just drop the tree directly into that is large enough and not tapered. That way the tree will go to the bottom of the pot. If it�s to tapered you will have a huge gap at the bottom. Also, try to go with a glazed pot that will not absorb water and possibly have the drain hole plugged.